The key term used most frequently. Understanding systems and how they work is critical to understanding systems analysis and design. system is an interrelated set of business procedures (or components) used within one business unit, working together for some purpose. For example, a system in the payroll department keeps track of checks, whereas an inventory system keeps track of supplies. The two systems are separate. A system has nine characteristics. A detailed explanation of each characteristic follows, system exists within a larger world, an environment. A boundary separates the system from its environment. The system takes input from outside, processes it, and sends the resulting output back to its environment. Components : An irreducible part or aggregation of parts that makes up a system; also called a subsystem. Interrelated components : Dependence of one part of the system on one or more other system parts. Boundary : The line that marks the inside and outside of a system and that sets off the system from its environment. Purpose : The overall goal or function of a system. Environment : Everything external to a system that interacts with the system. 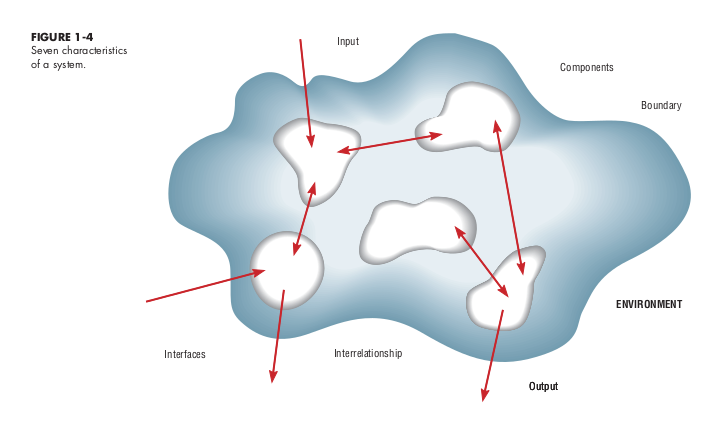 Interfaces : Point of contact where a system meets its environment or where subsystems meet each other. Constraints : A limit to what a system can accomplish. 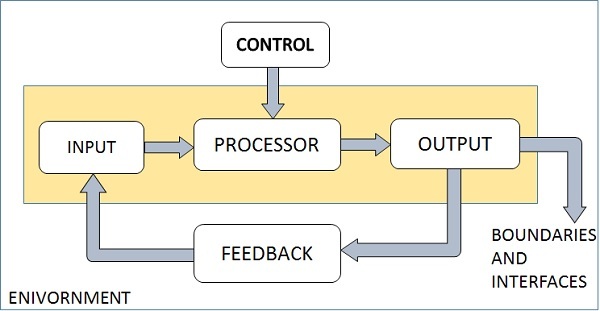 Input : Inputs are the information that enters into the system for processing. Output : The main objective of a system is to get an output which is helpful for its user. Output is the final outcome of processing. Example: Hierarchical organization in a company. Example: the main memory holds the data that has to be operated by the ALU. static or dynamic in nature. Programs, data, and applications can change according to the user's needs. Abstract systems are conceptual. These are not physical entities. They may be formulas, representation or model of a real system. Closed systems: Systems that don't interact with their environment. Closed systems exist in concept only. Information system is the basis for interaction between the user and the analyst. Main purpose-manage data for a particular organization. Informal Information Systems: Informal systems are employee based. These are made to solve the day to day work related problems. in organizations capture and manage data to produce useful information that supports an organization and its employees, customers, supliers, and partners. Many organizations consider Information systems to be essential to their ability to compete or gain competitive advamage. Most organizations have come to realize that ail workers need ro participate in the development of informatlon systems. Transaction processing systems (TPSs) process business transactions such as orders, thne cards, payments, and reser'latlons. Management Information systems (MISs) use the transaction data to produce lnformatlon needed by managers to run the business. Decision support systems (DSSs) help various decision makers Identify and choose between options or decisions. Executive information system (EIS) are tailored to the unique information needs of executives who plan for the business and assess performance against those plans. Expert systems capture and reproduce the knowledge of an expert problem solver or decision maker and then slmulate the “thinking" of that expert. Communications and collaboration system enhance communlcatlon and collaboration between people, both Internal and extenal to the organization. is a direct result of decomposition. It refers to dividing a system into chunks or modules of a relatively uniform size. Modules can represent a system simply, making it easier to understand and easier to redesign and rebuild. For example, each of the separate subsystem modules for the MP3 player shows how decomposition makes it easier to understand the overall system. means that subsystems are dependent on each other. Subsystems should be as independent as possible. If one subsystem fails and other subsystems are highly dependent on it, the others will either fail themselves or have problems functioning. components of a portable MP3 player are tightly coupled. The best example is the control system, made up of the printed circuit board and its chips. Every function the MP3 player can perform is enabled by the board and the chips. A failure in one part of the circuit board would typically lead to replacing the entire board rather than attempting to isolate the problem on the board and fix it. Even though repairing a circuit board in an MP3 player is certainly possible, it is typically not cost-effective; the cost of the labor expended to diagnose and fix the problem may be worth more than the value of the circuit board itself. In a home stereo system, the components are loosely coupled because the subsystems, such as the speakers, the amplifier, the receiver, and the CD player, are all physically separate and function independently. If the amplifier in a home stereo system fails, only the amplifier needs to be repaired. is the extent to which a subsystem performs a single function. In the MP3 player example, supplying power is a single function. This brief discussion of systems should better prepare you to think about computer-based information systems and how they are built. Many of the same principles that apply to systems in general apply to information systems as well. In the next section, we review how the information systems development process and the tools that have supported it have changed over the decades.